Brought this comforter for my granddaughter birthday and she loves it. Hope I can find unicorn window treatment. I recommend this comforter to brighten any girl room. Unicorn theme comforter and sham set is the perfect addition to your child's bedroom. The face of the comforter and sham spotlights a whimsical design of colorful rainbow unicorns, hearts and clouds on a pink ground. Constructed of 100-percent cotton, this set offers style and comfort and is machine washable. My Daughter is in love with unicorns and she loves this comforter. The color are great on the comforter, they really brighten up the room. The comforter is not too heavy and can be used in all seasons. 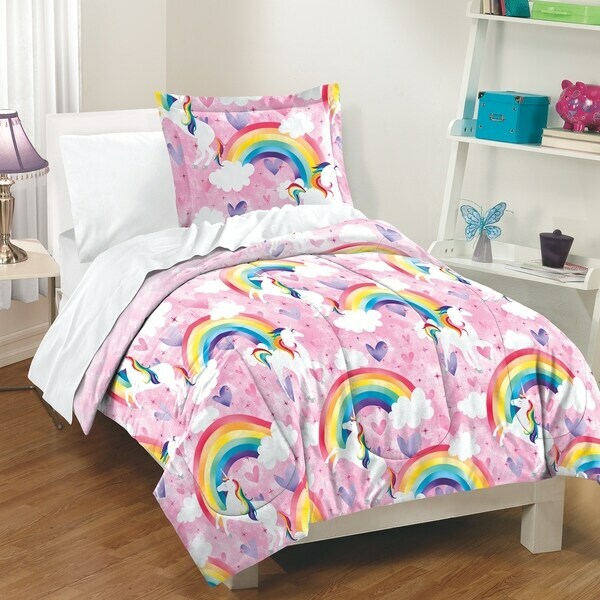 My granddaughter LOVES her new Unicorns and Rainbows Comforter set!! Very quick shipping too!!! I purchases a twin size comforter for a full size bottom bunk bed, and it fit perfectly! I searched online for about two weeks for a unicorn comforter for my 4 year old, and finally found this. We both absolutely love it! I was last to how heavy it was going to be, but it's perfect for our cold winter in Ohio. Very happy with this product! Also, the full/queen size had me scared it wasn't going to fit her queen bed, but it comes down past the mattress perfectly! I ordered this spread for my granddaughter. The colors are as shown and the fabric is good quality! She loved it!! I would definitely recommend this product to a friend. My granddaughter loves this comforter. The colors were true to the picture. Fluffier & heavier than I thought it would be, but very nice. I also purchased the Stella Rainbow Shag rug to go along with the rainbow and unicorn theme. They both looked very nice together. My daughter loves it! I loved the picture online. Thought it was a little pricey. The comforter was sent with very visible damage. Very disappointed as it was a birthday present for my granddaughter who lives in a different state. Hope the exchange happens quickly. She loved it. Really cute and good material. Happy with the weight and quality of the products. Love it! My granddaughter has no complaints. Very pretty unicorn set for a unicorn fan! Just what my niece would love for Christmas!